Just as Sophie Mercer has come to accept her extraordinary magical powers as a demon, the Prodigium Council strips them away. Now Sophie is defenseless, alone, and at the mercy of her sworn enemies—the Brannicks, a family of warrior women who hunt down the Prodigium. Or at least that’s what Sophie thinks, until she makes a surprising discovery. The Brannicks know an epic war is coming, and they believe Sophie is the only one powerful enough to stop the world from ending. But without her magic, Sophie isn’t as confident. Sophie’s bound for one hell of a ride—can she get her powers back before it’s too late? I feel like reading the books in the short span of time that I did (over two days) helped me realize just how much Hawkins' writing style and characterization had improved over the course of the three books. 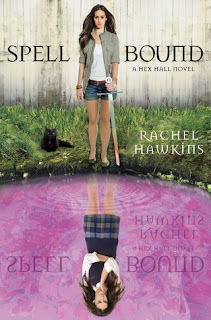 In Spell Bound, she was at her best. The witty dialogue and actions of the characters were on point. The reader felt like they knew the characters and I could easily understand what each character was thinking about doing before they even thought of it. Sophie was actually a pretty great heroine. She was witty and snarky but didn't think she was doing something spectacular until someone else told her she was. I think it is always difficult when you are in the head of the protagonist because sometimes you forget that they are doing something incredible until another character mentions to them that what they are doing is so great. You come to think of the protagonist as yourself and, just like in real life, overlook some of the better things you do. Everything tied together nicely -- it was great to see that all the plot points weren't overlooked or forgotten and everything was cleared up. However, I thought the pacing this time was a little off. It seemed like there were so many ideas and things that needed to happen that they were rushed at some points so that everything could be included. Even adding another 20 pages or so in order to clear everything up without things overlapping or feeling as though they were done extremely quickly would have made this a better read for me. Overall: 3/5 stars. For being the ending of a series, it felt kind of rushed. I would have liked some things to have been explained better and obviously for some things to end differently. This series was an okay read but not one I will reread like some other series.